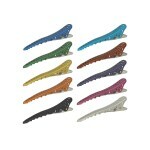 YS Park Clips are made from extruded aluminum and then anodized in fun, attractive colors. YS Park Clips bring a new level of sophistication to hair accessories. The YS Park Clip’s aluminum body, anodized coating and stainless steel spring make it a resilient partner to the stylist that demands performance and durability. 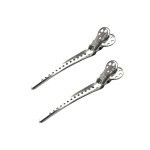 YS Park Medium ClipsYS Park Medium Clips are perfect for making small sections or for highlighting sections of the hair. The holes at the grip make it easier for hair stylists to hold without slipping.Size: 10 PackFeatures & Benefits: Perfect for small sections or for highlighting sectioning of the hair Holes at the grip make it easier for hair stylists to hold without slipping 2 of each color: b..
YS Park Pro Clips - BlackPro Clips Black. Strong and sophisticated, YS Park Pro Hair Clips are made to satisfy all needs. Stylists in New York, Beverly Hills, and London call these the "Best clips in the world." Specially engineered in the length of a finger and the shape of a head, YS Park Hair Clips are strong, efficient and highly acclaimed by stylists everywhere.Size: Single & 2 PackFeatures &..
YS Park Pro Clips - BluePro Clips Blue. Strong and sophisticated, YS Park Pro Hair Clips are made to satisfy all needs. Stylists in New York, Beverly Hills, and London call these the "Best clips in the world." Specially engineered in the length of a finger and the shape of a head, YS Park Hair Clips are strong, efficient and highly acclaimed by stylists everywhere.Size: Single & 2 PackFeatures & B..
YS Park Pro Clips - BronzePro Clips Bronze. Strong and sophisticated, YS Park Pro Hair Clips are made to satisfy all needs. Stylists in New York, Beverly Hills, and London call these the "Best clips in the world." Specially engineered in the length of a finger and the shape of a head, YS Park Hair Clips are strong, efficient and highly acclaimed by stylists everywhere.Size: Single & 2 PackFeatures..
YS Park Pro Clips - GreenPro Clips Green. Strong and sophisticated, YS Park Pro Hair Clips are made to satisfy all needs. Stylists in New York, Beverly Hills, and London call these the "Best clips in the world." Specially engineered in the length of a finger and the shape of a head, YS Park Hair Clips are strong, efficient and highly acclaimed by stylists everywhere.Size: Single & 2 PackFeatures &..
YS Park Pro Clips - PinkPro Clips Pink. Strong and sophisticated, YS Park Pro Hair Clips are made to satisfy all needs. Stylists in New York, Beverly Hills, and London call these the "Best clips in the world." Specially engineered in the length of a finger and the shape of a head, YS Park Hair Clips are strong, efficient and highly acclaimed by stylists everywhere.Size: Single & 2 PackFeatures & B..
YS Park Pro Clips - PurplePro Clips Purple. 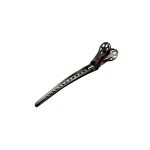 Strong and sophisticated, YS Park Pro Hair Clips are made to satisfy all needs. Stylists in New York, Beverly Hills, and London call these the "Best clips in the world." Specially engineered in the length of a finger and the shape of a head, YS Park Hair Clips are strong, efficient and highly acclaimed by stylists everywhere.Size: Single & 2 PackFeatures..
YS Park Pro Clips - SilverPro Clips Silver. Strong and sophisticated, YS Park Pro Hair Clips are made to satisfy all needs. Stylists in New York, Beverly Hills, and London call these the "Best clips in the world." Specially engineered in the length of a finger and the shape of a head, YS Park Hair Clips are strong, efficient and highly acclaimed by stylists everywhere.Size: 2 PackFeatures & Benefi..
YS Park Shark ClipStrong yet gentle, YS Park Shark Hair Clips are made to satisfy all needs. Look for YS Park's Goriki mark when making any purchase. Specially engineered in the length of a finger and the shape of a head, the new YS Park Shark Hair Clips are strong and highly efficient.Size: SingleFeatures & Benefits: Tough and sophisticated Improved version of the standard pin Engineered and sui..
YS Park Yonesho Duck ClipsYS Park Yonesho Duck Clips. Rubber grips ensure busy hands won't slip. 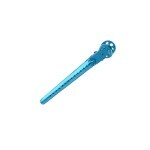 Narrow shaft works well with fine/thin hair, foiling, and other chemical applications. 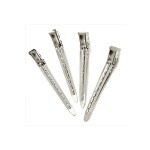 Stainless steel clip and pin prevent rust and tarnish. Clip length is approximately finger length for better control.Size: 12 PackFeatures & Benefits: Rubber grips Narrow shaft Stainless steel clip and pin Clip is f..